Today's main event was an incursion onto the 29 Palms Marine Base in the Mojave Desert to reach Sunshine Peak, a P1K in the Lava Bed Mountains. It rises somewhat dramatically from its surroundings, the highest object for some miles in all directions. The range highpoint, Argos Mtn, lies about 4mi to the southwest separated by a deep wash. Both Jeff and Karl had suggested we add this second P1K to the agenda, but I thought just doing the one would be enough trespassing for the day. 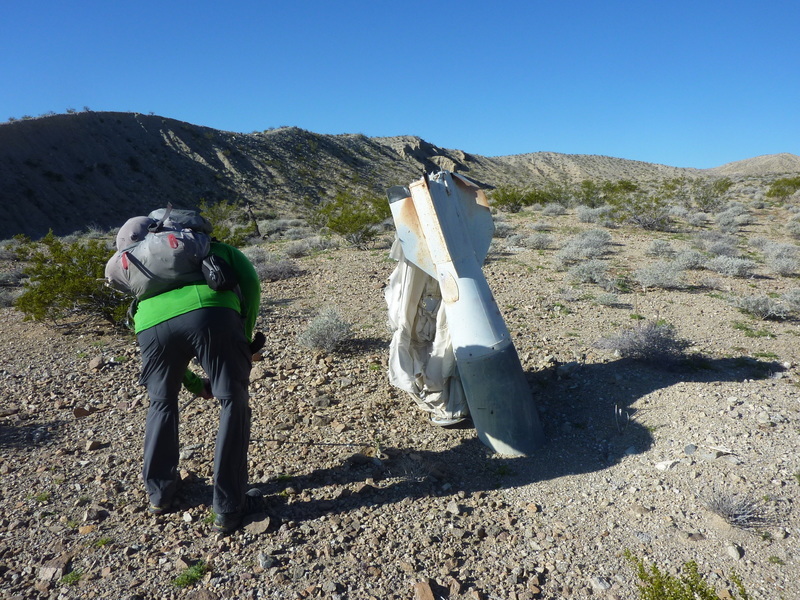 Afterwards, we tackled some easier summits back on BLM lands in the same area. We decided to do a point-to-point hike for Sunshine, leaving two of our cars where we'd camped for the night along the utility road, then carpooling about five miles to the southwest on the same road. This put us about 1.5mi northwest of Peak 4,460ft, also within the military reservation, as a bonus we could do with Sunshine. It has almost 500ft of prominence and is slightly higher than Sunshine (indeed, it is the 2nd highest summit in the range), but it isn't very impressive, particularly from the direction we approached it. We had to climb about 700ft in 2.5mi, taking about 50min up easy, gradual slopes. The peak had a fine, early morning view of the western half of the base. From our vantage, we could see no sign of development anywhere on the base save for a tower complex atop Argos Mtn; no roads, no movement of any kind. It did not appear that we would be interfering with any military exercises today. We continued over the summit and down the southeast side, descending into the large wash draining east. The wash made for easy walking and kept us out of sight. It probably mattered little whether we followed a ridgeline instead, as there was scant chance of anyone finding us out here, but somehow it made us feel better to be tucked into the wash. About half an hour after leaving the summit we came across a curious and unsettling find - a large bomb that was partially buried in the ground with a worn parachute dangling off the tail. We couldn't figure out why they would deploy a parachute on a bomb - to give someone on the ground time to shoot it down? It seemed maybe this was a way to do practice bombing, then being able to reuse inert bombs as a cost-saving measure. Later, I found that the parachutes (more like a drag chute) were often employed in low-elevation bombing to slow the bombs and allow the plane to avoid the blast zone. We had no idea whether these things were live rounds or not, but we made the safe assumption that everything we saw was live and made no effort to pick up or touch anything that remotely looked like an unexploded ordinance. This first find was enough to spook Karl into abandoning the effort and he chose to leave us and return more directly to his car parked at the campsite. Jeff and I bade him goodbye and continued on our way towards Sunshine Peak. This of course was only the first find we came across as we crossed the wide, shallow valley between the two summits. It was soon evident that this had been extensively used as a gunnery range for many decades, though it appears it has also been at least several decades since it was last used for this purpose. There is a dirt road running down the middle of the valley that we crossed on our way, tire tracks indicating it is still used occasionally, but probably not more than once a month or so. We came across many, many more munitions in a stretch about a mile long. Most of the stuff was fragments from the majority that exploded, but there were plenty of unexploded ones lying on the ground or partially buried. We spent more time looking at the ground to see where we were placing our feet than anywhere else during this time. As we started up the slopes out of the valley with a mile remaining, the amount of blast material tailed off and we could relax more. It would take us another 45min to make our way to the summit without anything more than class 2 to contend with. We had a small drop along the way as we had started up towards the peak a little too far to the north, but this was of little consequence. It was 10:15a by the time we topped out. There were a few items left by military personnel at the summit including a survey marker from the 11th marines back in 1994. A few ordinances scattered about the summit area suggested it was occasionally targeted, but certainly not a regular thing. We imagined a few playful pilots having fun unloading their last bombs on the peak, perhaps against the regular rules of the exercises they were participating in. From the summit we could again see no sign of development anywhere on the base that we could see, excepting Argos Mtn's summit. In addition to what looked like an old tower design, there were a number of shipping containers parked to one side. There did not appear to be any activity on the summit. Indeed, if one looks at the satellite view, it is clear there is no road leading to the top, so it is unlikely to be manned and is probably an abandoned site now - good to know for later use. We spent maybe 15min at the summit, deciding not to leave a register since the summit seems to see occasional military visitors. No need to press our luck on this one. After another mile on the road we got out of the gunnery zone, and eventually left the road to continue cross-country more directly towards our vehicles. It was nearly 1p by the time we got back to the transmission lines and the two cars. I had expected Karl would have gone off to climb something else instead of waiting for us, but he was half-napping in his Element, having enjoyed lunch and the fine noontime weather. We went back up the utility road to fetch the jeep and do a few other hikes while we still had plenty of daylight. Located about 3mi WSW of the day's first peak, I had thought this one was also within the base boundary. It turns out there's a section of land SE of the utility road that is BLM and state lands, including the summit of Bess BM. We were able to drive the jeep down a side road to get within 2/3mi of the summit on its NE side. The hike to the top was easy class 2, taking less than 20min. There is another road approaching from the northwest that circles around the summit before coming to a clearing just below the top. It doesn't appear to get much traffic, but might be used to make this a near drive-up. The summit wasn't all that impressive, but it has nice views. Back at the jeep, we returned to the utility road and then north on a rougher road just east of the Rodman Mtns Wilderness. These two summits are located about 1.5mi from each other, one inside the Wilderness, the other outside. We followed the road as it traveled down a gravelly wash, stopping on the southeast side of Peak 3,608ft. Starting from here, we made a 4mi+ loop to tag the two summits in turn. There was some graffiti scratched in the volcanic rocks atop Peak 3,608ft, notably from the USGS surveyor who had done the spot elevation measurements back in 1954. It took us an hour to get from the first summit to the higher Peak 4,108ft where a large cairn is found (but no register on either one). There were some interesting prospects dug into the hillsides near where we'd parked which we explored briefly on our return.